The MicroSplatch™ embedded antenna is perfect for remote controls, pagers and compact data transmission devices. It is available in the 403MHz, 418MHz, 433MHz, 868MHz, 916MHz and 2.4GHz bands. 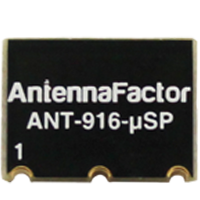 The antenna's affordable price and reflow-compatible package makes it an excellent choice for cost-sensitive applications.